Technology Services of Iowa, LLC: Does Your Cell Phone Need A Boost? Does Your Cell Phone Need A Boost? It's not uncommon to have issues making or receiving cell phone calls in certain geographical areas around Kalona and other neighboring communities. I can't think of any single carrier that can claim they don't have a dead spot or two around this area. The same can be said for pockets with slow data transmission through your smartphones too. Well, now there is a solution. 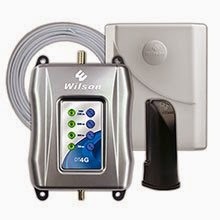 The Wilson Electronics DT4G cell phone booster. In stock and available today at Kalona RadioShack, the Wilson cell phone booster will improve your coverage, including 4g, 3g, and 2g data coverage for subscribers of nearly all US carriers. It's designed to work in your home or office and will boost your signal making it much stronger and more reliable. Longer battery life for your cellular device.